A C-22 Asbestos Abatement license is issued by the CSLB, only to applicants who are registered with the Department of Industrial Relations’ Division of Occupational Safety and Health (DOSH) or have an active application for registration in process with the Division. In case the applicant does not have any proof of being registered with DOSH, CSLB will issue the license on the condition that the contractor submits the said proof within 90 days following the license issuance. In such an instance, the contractor may not begin any asbestos related work until the required proof has been submitted to the CSLB. In the initial review process, DOSH will analyze the documentation, along with your compliance history and the procedures you have proposed. They might also need you to provide additional explanations or revisions to the procedures if they consider it necessary. Once you pass this initial review, you will be issued a registration certificate, valid for a time period of 1 year, unless revoked. To obtain the Asbestos Abatement Certification, the applicant should have completed the relevant training requirements contained in Section 1529 of Title 8 in the California Code of Regulations. Get the detailed information regarding the required trainings and the class levels it covers from the CSLB website. As with all other general and specialty classifications under CSLB, every applicant for the C-22 classification will also be required to fulfill certain experience requirements. Within the 10 years, immediately prior to the application process, the applicant should have at least 4 years of experience performing asbestos abatement processes as a foreman, journeyman, contractor or a supervising employee. A Certification of Work Experience must be submitted. The criteria for places an applicant can get the relevant experience from, has also been defined by the CSLB. If the applicant does not have experience as specified by the Board, but does have some knowledge and understanding in another setting, he should submit any relevant documentation – it will be considered on a case-to-case basis. When the CSLB receives your application, a notice of acknowledgement will be sent to you explaining how to check the status of the application online or by calling the 24-hour automated phone system at CSLB. The notification will also contain information on how to submit your fingerprints as required. Do not forget to include the Application Fee Number in any correspondence. 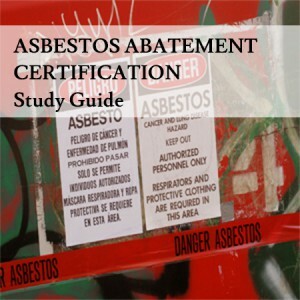 As with all CSLB classifications, applicants for the C-22 Asbestos Abatement classification must also pass a trade examination and a law and business exam. The exam can be scheduled as early as 15 days from the acceptance of your license application. A complete study guide and other related information is available from the CSLB online. You can also get information regarding the exam by calling the automated 24-hour phone system at (800) 321-CSLB (2752). The process to becoming a licensed asbestos abatement contractor may be long, but putting in the effort at the right time would be very beneficial for you in the long run. So take some time and research well into all the things you will need to successfully obtain this license. The Peerless Institute guarantees that you will pass the first time or we will work with you to ensure you pass the next time at no extra cost! Our goal is for you to pass the exam and get your license and we stand by our commitment to you.